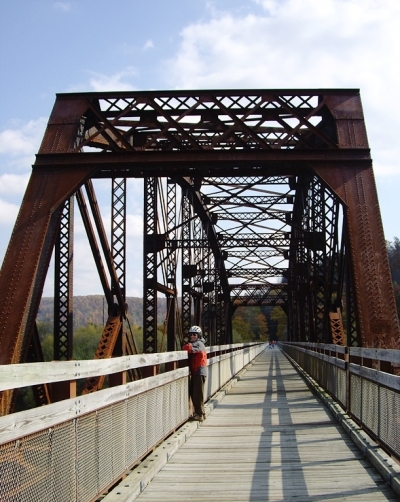 The Sandy Creek Trail is nineteen miles of rail-trail constructed on a section of the abandoned Franklin-Clearfield Railroad. The Belmar trailhead is at Belmar Village on the west side of the River. Access is from Route 8, 3 miles south of Franklin. Turn on Pone Lane and go past the Franklin High School to Belmar Road. Turn right and follow it to the parking area at the foot of the hill with the river and bridge in sight. The east-end trailhead is in the village of Van on Route 322. Follow 322 to Van, turn west onto Tarklin Hill Road and go about 1/2 mile to the parking area. Rockland Road - The trail may also be accessed from the Rockland Road. Follow Route 322 to the intersection of Route 257 in Cranberry (site of the Cranberry Mall), turn south and travel about 3 miles until you cross over the old railroad grade (just before you cross East Sandy Creek). There is an access road that turns to the right. Fisherman’s Cove - Reach the access at the far western end of the trail by traveling on old Route 8 (north from I-80 turn to old Route 8 just north of Barkeyville, or south by leaving new Route 8 just south of Franklin before new Route 8 becomes a divided highway) and turning off onto a dirt road at the end of the Pecan Bridge at the sign that leads to Seneca Hills Bible Camp. Turn right at the foot of the hill, and travel along the dirt road about 3 miles. At a sharp right turn, the trail is just ahead. Park along the road. The Sandy Creek Trail is nineteen miles of rail-trail constructed on a section of the abandoned Franklin-Clearfield Railroad. The railroad was constructed in 1905-1906 cutting through very rugged terrain requiring a number of stream crossings, tunnels and trestles. Its unique character is that there is no visable development along much of its length providing an uninterrupted view of Penns Woods at its finest. The views from the bridges of the meandering Sandy Creek are spectacular and the mixture of conifers and deciduous trees provide year round color. It crosses the Allegheny River (and the Allegheny River Trail) at Belmar on the spectacular Belmar Bridge, a 1385' railroad bridge adapted for safe pedestrian travel and a unimpeded view of the river valley. the Allegheny River Trail may be accessed by a stairway. Eight miles of the trail from Belmar to Van are asphalt surface with six bridges and a tunnel. These miles are heavily used by walkers, runners, in-line skaters, and bicyclers. The remaining trail is original ballast suitable for mountain bikes, and is scheduled for surfacing in the near future. Access points are at Belmar, Rockland Road, and Van with suitable parking at each location. 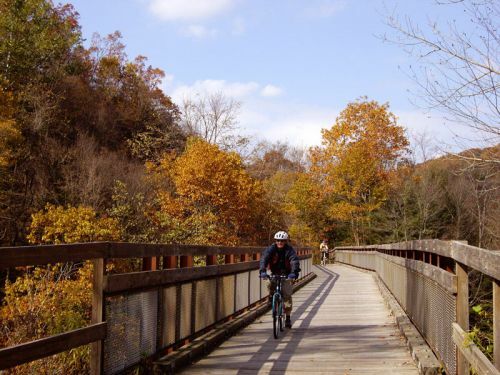 The Allegheny Valley Trails Association (AVTA) owns, has developed, and manages the Sandy Creek Trail. AVTA is a private non-profit all-volunteer organization. All funds raised go to the development and maintenance of trails. Belmar Bridge. Photo by Mary Shaw. 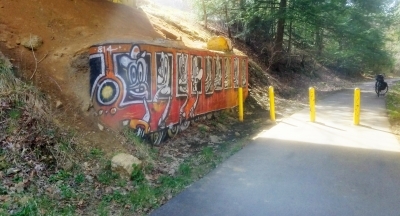 Trolley Mural. Photo by Mary Shaw.